The program Dynamic Notes is a multi-featured scheduler, reminder, and organizer for Windows allowing you to create electronic stickers and display them when the time is due. The program is very easy to use and has low system requirements. The scheduler stays in the tray and does not interfere with your activities. If necessary, it can be displayed as a small toolbar on the desktop. All the parameters you may need to change are customizable: a sticker can be of any size, it can have any color scheme (which can be useful, for example, to tell between stickers on different topics) and you can use various skins for stickers. We also implemented sound schemes to accompany the display of stickers. Together with the wizard for creating stickers, it is possible to edit them either quickly or in the advanced mode. The program also supports a multilingual interface. You will never forget anything with Dynamic Notes! 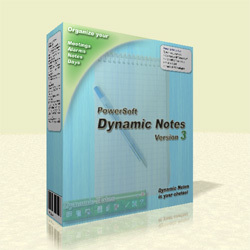 dynamic notes,desktop notes,notes reminder,planner notes,desktop reminder,sticker,sticky notes The program Dynamic Notes is a multi-featured scheduler, reminder, and organizer for Windows allowing you to create electronic stickers and display them when the time is due. The program is very easy to use and has low system requirements.